Helping with my sister's baby shower today. This is what we are drinking. More details soon to come. Oh, by the way. I'm spending the entire weekend sans kids! Thank you Shane. Hope you and the kids are having a great time back in Boise. I'm having a great time here in Utah. 1. 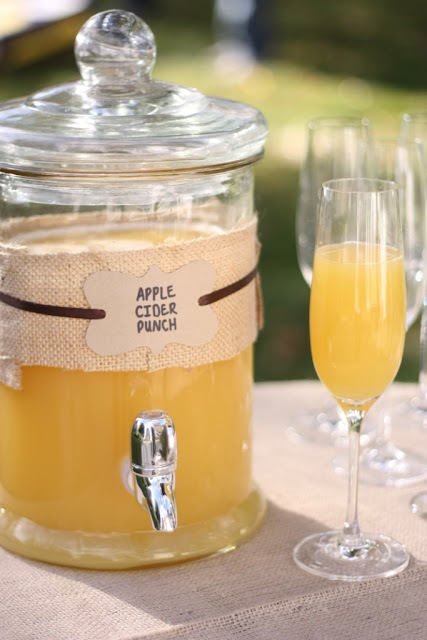 In punch bowl, large pitcher, or pitchers combine apple cider, orange juice, and lemon juice. Slowly add sparkling white grape juice. Serve immediately. mmm can't wait to try to make some!! Also, where is the vessel from, it's absolutely perfect for these sort of occassions? Totally making this for my daughter's birthday party on Saturday! I've been looking for a yummy fall drink to serve! Thank you! oh yummy! and i love these large pitcher jars. very classy. How many servings does this make? I am using it for a fall wedding shower this week....sound yummy! How many servings does this make? I am using it for a fall wedding shower this week....sounds yummy! I believe we made it for 16 people. Is this to be served warm, chilled, or room temperature?